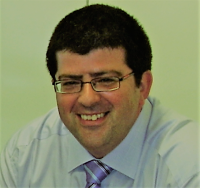 The ESCMID Executive Committee has appointed Prof. Jacob Moran-Gilad as the next Programme Director of ECCMID. Prof. Moran-Gilad will start working as a Deputy Programme Director, together with Prof. Winfried Kern, the current Programme Director, in preparing the scientific programme and overseeing the organization of ECCMID. Prof. Moran-Gilad is a Medical Doctor board-certified in clinical microbiology and public health. He is a professor of clinical and public health microbiology at the Ben-Gurion University of the Negev, Beer-Sheva, Israel, and principal investigator of the MAGICAL group (Microbiology, Applied Genomics and Infection Control Applications Laboratory). He also serves as a consultant clinical microbiologist for the Soroka University Medical Centre and as a senior advisor to the Israeli Ministry of Health, overseeing a range of national cross-sector and policy-making activities related to communicable diseases. Prof. Moran-Gilad is the chairperson of the ESCMID Study Group for Genomic and Molecular Diagnostics (ESGMD) and a board member of the ESCMID Study Group for Legionella Infections (ESGLI), the treasurer of the Israeli Society for Infectious Diseases and an associate editor with Eurosurveillance. The ESCMID Executive Committee thanks Prof. Moran-Gilad for his engagement and send him a warm welcome! Last week for submitting proposals for ESCMID’s research grant round 2019! Apply before September 25th 12:00 CEST to be among one of ESCMID’s grantees receiving 20,000 EUR. For detailed information and guiding materials, have a look at our website. Nominations are now being accepted until 11 October 2018 at 12:00 noon CET for the Young Investigator Award, which rewards outstanding research and stimulates further studies at the highest scientific level. 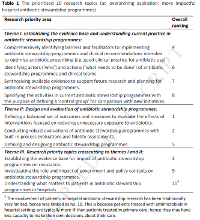 Rzewuska et al used a behavioral perspective to develop a consensus procedure in which priority areas for research are proposed to optimise effective implementation of antibiotic stewardship programmes (ASPs) in hospitals. The 10 identified research priorities were collected under three main themes. These related to establishing the evidence base and understanding of current practices in ASPs; design and evaluation ASPs; and research priorities relating to both areas. The authors recommend revising and updating this priority-setting exercise every two years as well as extending the exercise to include priorities relevant for low- and middle-income countries.